At issue is whether UN expert Coomaraswamy should be able to include in the Annexes of her reports on child soldier recruit countries which are not on the agenda of the Security Council. To date, for example, Sri Lanka has been in Annex II, as has Myanmar. As Inner City Press has reported, Pakistan was left off despite then UN envoy Jean-Maurice Ripert telling the media that groups in Pakistan routinely recruited child fighters. Other controversies involve the possible inclusion of Mexico, where children have been recruited into well armed drug gangs. When Coomaraswamy held her last press conference at the UN, Inner City Press asked her about Mexico, and why it is not included. She pointed to the envoy on Children and Violence and said that is where Mexico would be dealt with, and Pakistan too, it seems. Despite Coomaraswamy inexplicably or at least arbitrarily not including Pakistan and Mexico, she is still under fire, to stop including Myanmar. Cynics might wonder that while India might want to help Myanmar get off the list, it might have even have supported Coomaraswamy to put Pakistan on. The moral of this story might be, either go all the way, without fear or favor -- i.e. list Pakistan and Mexico as well as Myanmar -- or don't go at all. Or at least face push back. Update of July 11: asked by Inner City Press for India's position, Permanent Representative Hardeep Singh Puri on July 11 said, "We don't like mandate creep," of Ms. Coomaraswamy's office. He said that the implimentation of Resolution 1973 on Libya is "mission creep," and this on children and armed conflict has been "mandate creep." We will cover more on this - watch this site. UNITED NATIONS, July 8 -- In the run up to a July 12 Security Council meeting on children and armed conflict, Permanent Representatives were called to an “emergency” meeting Friday at 5 pm. Sources told Inner City Press that for example Colombia is concerned that, because of child recruitment in its borders, it could be subject to “mechanisms,” even though it is not on the Security Council agenda. “No one wants to be on any list,” he genially quipped. Other sources say that Brazil is supporting Colombia's position and that India, too, has its own concerns. Another Permanent Representative said there could be a solution for Colombia, some generally language about "dealing with Ms. Coomaraswamy," the adviser on children and armed conflict. Colombia has previously tangled with Coomaraswamy, click here for that story from Inner City Press. Meanwhile countries not involved in the fracas wondered why they had to come in “at such a high level, and through the rain” when the Council debate is not until Tuesday. We'll see. On Sudan, Could an UNMIS “Wrap-Up” Resolution Provide S. Kordofan Protection? UNITED NATIONS, July 8 -- As the UN Security Council adopted its resolution for 7000 peacekeeping troops in South Sudan, behind the scenes negotiations continued to see if a separate resolution on the dissolving UN Mission in Sudan was needed, and what it could accomplish. 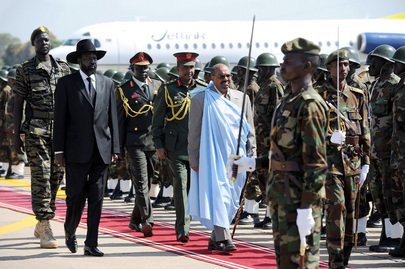 Sudan's president Omar al Bashir, indicted by the International Criminal Court for genocide in Darfur, has ordered the UN mission in North Sudan to start winding down the moment South Sudan declares independence. But the political coordinator of a BRICS country told Inner City Press that it is possible that a “wind-up” resolution could provide for UN peacekeepers staying in the violent border areas of South Kordofan and Blue Nile at least while the mission is being wound up. “That would require the consent of Bashir,” a representative of a Permanent member of the Council pointed out, adding that the UN Department of Field Support and Office of Legal Affairs, headed by Patricia O'Brien, had been asked to opine if a wind up resolution is needed. The spokesman of another Permanent member said that negotiations were continuing, even on the eve of South Sudan's independence, with Ban Ki-moon in Khartoum, meeting with not with Bashir but foreign minister Ali Karti. “It would be a good message to have such a resolution,” the representative said, indicating the UN was not just getting thrown out. But isn't it? At Friday's UN noon briefing, Inner City Press asked Ban's acting deputy spokesman Farhan Haq about reports that the Egyptian UN peacekeepers in Kadugli in Southern Kordofan sat by while civilians were killed right outside their gates, and that two Nuba UN local staff were killed. Haq denied the later, and pointed to earlier statements on the former. Inner City Press is still waiting for a response from UNMIS promised earlier in the week. Better hurry up: for now, UNMIS is over on July 9. Watch this site -- and this, Inner City Press July 7 debate on BloggingHeads.tv about Sudan.